Though every year boasts impressive nominees, it's not very often that the Best Original Song category at the Oscars is one of the most important of the night. But thanks to all of this year's major snubs, it's become one of the most anticipated categories at the 2015 ceremony. 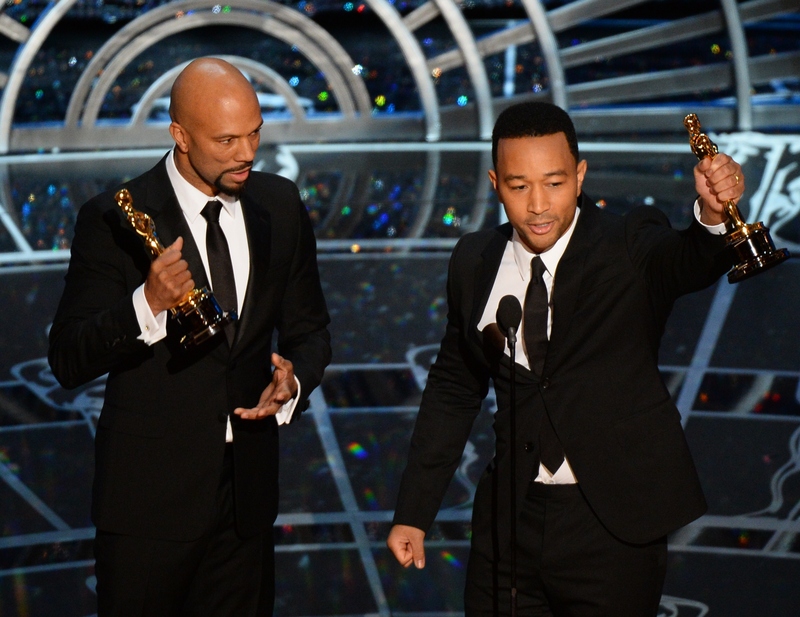 So when "Glory" won the Academy Award for Best Original Song, there was definitely a round of applause from not just those in attendance to see John Legend and Common accept the award, but viewers watching at home. Because while the nominees also included "Grateful" from Beyond The Lights, "I'm Not Gonna Miss You" from Glen Campbell...I'll Be Me, and "Lost Stars" from Begin Again, we all knew there were only two songs that could be in the envelope. Winner "Glory," or "Everything Is Awesome" from The Lego Movie. We also knew how deserving "Glory" was of the award, but the fact that its win came moments after an unforgettable live performance only made it that much more apparent. And just when you thought things couldn't get any more emotional, Legend and Common used their acceptance speech to reflect on the message of the song, and remind us all that while Selma was set in the past, its themes surround us in the present. First off, I'd like to thank God that lives in us all. Recently, John and I got to go to Selma and perform "Glory" on the same bridge that Dr. King and the people of the civil rights movement marched on 50 years ago. This bridge was once a landmark of a divided nation, but now is a symbol for change. The spirit of this bridge transcends race, gender, religion, sexual orientation, and social status. The spirit of this bridge connects the kid from the South side of Chicago, dreaming of a better life to those in France standing up for their freedom of expression to the people in Hong Kong protesting for democracy. This bridge was built on hope. Welded with compassion. And elevated by love for all human beings. Thank you. Nina Simone said it's an artist's duty to reflect the times in which we live. We wrote this song for a film that was based on events that were 50 years ago, but we say Selma is now, because the struggle for justice is right now. We know that the voting rights, the act that they fought for 50 years ago is being compromised right now in this country today. We know that right now the struggle for freedom and justice is real. We live in the most incarcerated country in the world. There are more black men under correctional control today than were under slavery in 1850. When people are marching with our song, we want to tell you that we are with you, we see you, we love you, and march on. Between their performance, win, and speech, I think it's safe to say Common and Legend had one of the biggest impacts on the 2015 Academy Awards, and found the best possible use for their spotlight. Watch their speech below.